If you’ve ever wanted to escape on a girlfriends’ getaway, we've got a destination that’s perfect for cowgirl fun. If you’ve ever wanted to escape on a girlfriends’ getaway, I’ve got a destination that’s perfect for cowgirl fun. 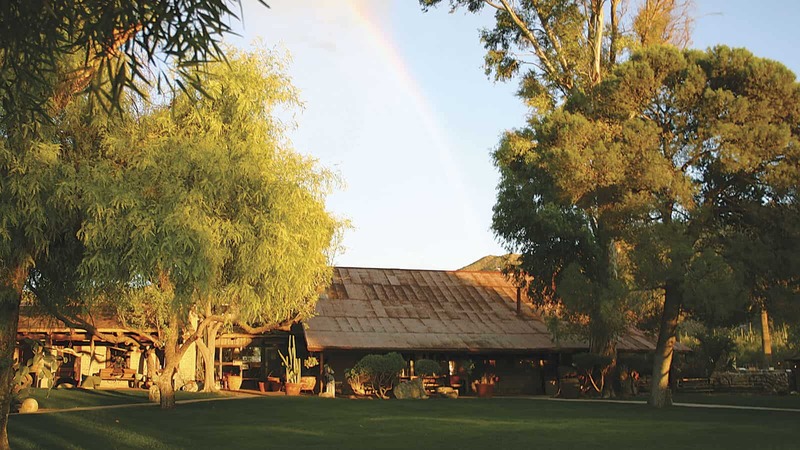 Tanque Verde Ranch in Tuscon, Arizona combines colorful history with typical southwest scenery and the comforts of a resort, making it a good ranch for riding and relaxing. After spending the winter in the chilly air outside of Washington, D.C., a good girlfriend and I devised the perfect winter remedy. 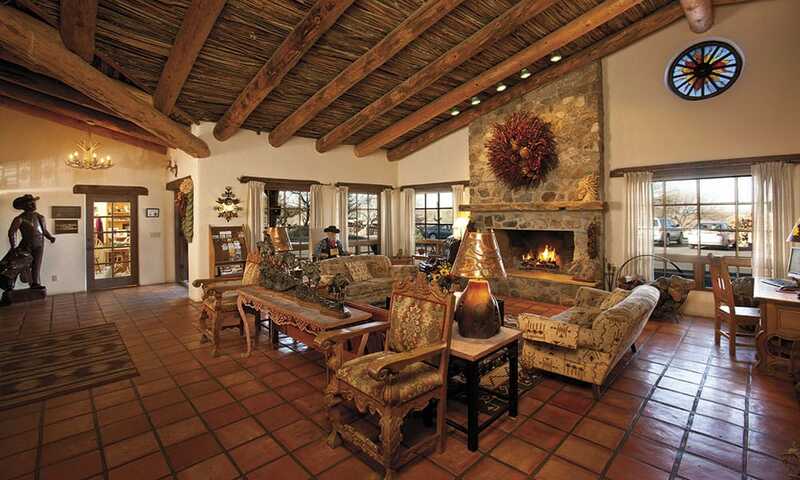 Escape to the sunny southwest and an Arizona guest ranch. I’d been to ranches almost everywhere else and wanted to see what a ranch in the Tucson area had to offer, so we saddled up at historic Tanque Verde Ranch. Ranches in the Tucson area provide travelers with something different- varied, rugged desert terrain where cactus dot the horizon mixed with Southwestern architecture, food and downtown Tucson shopping. An old time cattle ranch, Tanque Verde rests on 640 acres beside Saguaro National Park and Coronado National Forest, granting lots of room to ride. The vibrant salmon adobe styled ranch buildings brought a smile on my face as we hopped out of the van that drove us from the airport and walked towards the office to check in. I looked over to see un-blanketed horses, basking in the warmth of the corral and knew we’d made a good decision to head to Arizona. 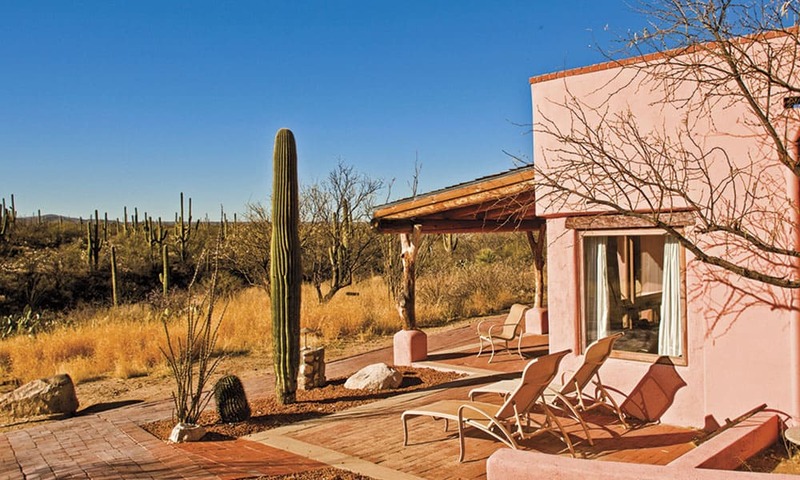 Tanque Verde is like an oasis amid the harsh terrain of the Sonoran Desert with green grass and flowers, birds singing and various desert fauna sprinkled around the grounds. The interior of the main lodge house. People have seen the area as a lush respite from the surrounding desert for quite some time. Tanque Verde means “green tank” in Spanish. Water on the property drew cavalrymen during the late 1800s to water their horses. Most men probably watched their backs as they let their steeds rest for a drink. The patrolmen had to constantly be on guard as they worked to protect area settlers and their cattle from Apache raids. Before them, the Pima Indians sought water here. After spending the night in my Western inspired suite, I woke up well rested for an early morning ride to check out the old homestead. With over 100 horses at the ranch, there are lots of riding choices for all levels of rider and if you want to brush up on your technique or lack thereof, you can always take a lesson. Our morning ride was leisurely and scenic and at about an hour to the Old Homestead, just enough to get me hungry. Darley and Powder on the trail. I watched my legs as my horse wound me through a labyrinth of prickly pear, cholla and giant saguaro, trees that can live to over one hundred and fifty years. 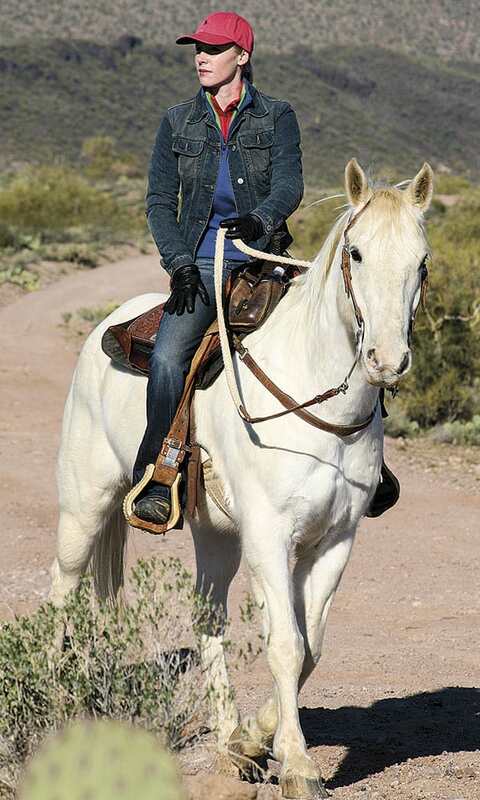 My Quarter horse, Powder, was a bit of a slow mover, but sturdy on the rocky trails. Better careful than not around those large saguaros! We traversed a few steeper inclines as we trekked through the beautiful desert surroundings. Guests have been known to spot deer, antelope jackrabbits, javelina and coyotes on the trails. A ranch has been on the grounds where Tanque Verde still rests since 1868, when Don Emilio Carrillo built his Buena Vista Ranch. In 1904, bandits seeking to cash in on some of Carrillo’s wealth ransacked the ranch in search of treasure. There’s an old legend that says that there’s gold buried somewhere on the ranch property and the robbers are thought to have been aiming to get it from Carrillo. Something to watch out for as you ride and explore! The distinctive pink architecture of the guest villas. At Tanque Verde’s old time dude ranch, though I wasn’t that far from town, I felt world’s away from it as we rode up to the breakfast spot at the old homestead, where an old stone building from days past remains. There are a few old buildings like this on the property that the ranch owners work to preserve as a symbol of the ranch’s colorful past. Out of a chuckwagon, I served myself a plate of blueberry pancakes, scrambled eggs, spicy sausage and hot cider. It all tasted good in the chilly morning air overlooking the vast desert’s rolling hills, but even better because we reached it on horseback. Later that day, we’d also enjoy a BBQ with live music and then cocktails in the Doghouse Saloon. While we loved the food and riding, we also liked the fact that for a gals adventure, this ranch also has a spa, yoga, tennis courts, fitness center and pool, so if we cowgirls got tired of each other, we could also do our own thing. This makes for happy travels together sometimes. Of course, basking in the sun is always a great way to beat the winter blues, even better if you can do it on horseback. Visit tanqueverderanch.com.